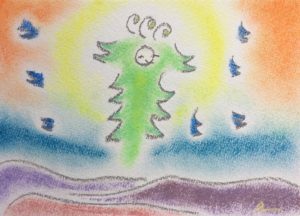 This picture was drawn at the day after that I decided to do the energy healing session in Sedona, Arizona. I feel something that was drawn in the middle of the picture is a fairy of Sedona. And the background seems like a dawn before the sun rising..
My energy healing session will begin at the moment of the sunrise. I believe it is not just a coincidence. I can imagine the fairy appeared to let me know that he or she support my healing.. This entry was posted in my works on 11/05/2017 by anne.